Think carefully about seed rates when drilling wheat crops this autumn to avoid compromising yield potential, is the advice from breeders Limagrain UK. Ron Granger, arable technical manager, acknowledges that getting seed rates right is complicated as it brings together a range of factors such as variety, drilling date, weather conditions, agronomic characteristics and importantly, experience of individual field performance. He says that this autumn we are looking at favourable establishment conditions. Where sowing conditions are optimal with good seed bed preparation and soil moisture, seed rates should be adjusted considerably as germination and plant establishment should not be compromised. As breeders, Limagrain does the work to ensure growers know how a variety behaves agronomically, and it’s important to build this into the seed rate equation, he says. 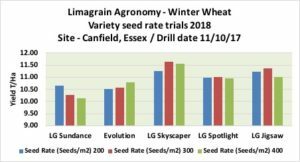 Limagrain seed rate trials carried out in 2018, Essex, show these differences. The trial comprised of 5 different varieties, drilled on the 11th October 2017 at 3 different seed rates of; 200, 300 and 400 seeds/m2. (Apart from the seed rates, all other agronomic inputs where kept the same. “What this translates to on-farm, is that growers should consider lower seed rates if planting LG Sundance before mid-October, to maintain optimum yields from the start,” he says. LG Jigsaw and LG Spotlight are high tillering varieties and again the data suggests that these varieties perform well at the lower seed rates – although the differences are subtle. 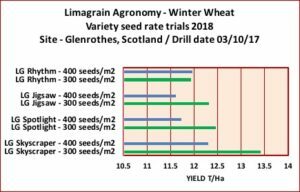 Limagrain also carried out a similar seed rate trial in Glenrothes, Scotland to provide important regional data sets for LG Wheat varieties. LG Skyscraper yielded a massive 13.4 t/ha when drilled at 300 seeds/m2. When drilled at 400 seeds/m2, this dropped to 12.3 t/ha – once again confirming that high seed rates don’t necessarily bring the highest yields. This was also the case with varieties; LG Spotlight and LG Jigsaw which produced the highest yields at the lower seed rate of 300 seeds/m2, showing yield penalties at the higher seed rate of 400 seeds/m2. 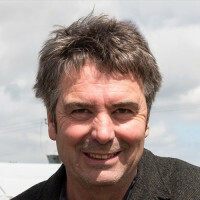 “These are significant penalties in yield and support the theory that high seed rates are not always the best way of achieving high yield potential, but again growers have to weigh up the risk associated at the time of drilling to ensure good crop establishment,” says Mr Granger.